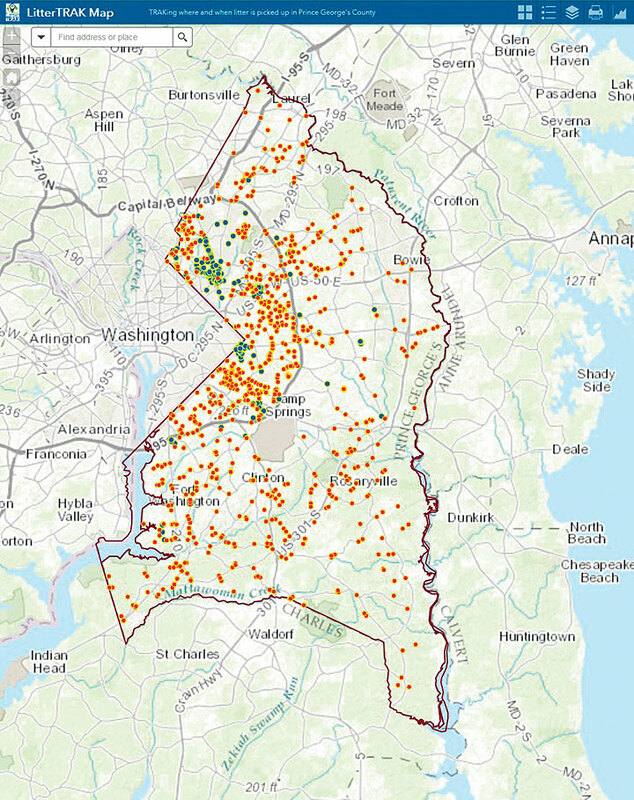 PGCLitterTRAK connects directly to LitterTRAK Map, an internal web-based map that employees at Prince George’s County can use to visualize the incoming data and make decisions about where to best allocate resources. Throughout the mid-Atlantic region of the United States, “Save the Bay” bumper stickers and signs adorn cars and store windows. They refer to the Chesapeake Bay—the largest estuary in the country—which stretches 200 miles and receives runoff from a vast watershed that contains about 18 million people. Unsurprisingly, the Chesapeake Bay faces considerable pollution issues. Prince George’s County, located just outside Washington, DC, sits in the bay’s smaller Anacostia River watershed—one of the most densely populated watersheds in the Chesapeake Bay drainage basin. With 900,000 people occupying almost 500 square miles of cities, suburbs, and farms, the county is especially concerned about storm water runoff polluting its waterways. Litter—which often gets washed up in storm drains and transported to local lakes and streams—is one of the most persistent pollutants in the county. Not only an unsightly blemish on the landscape, this garbage carries additional toxins into the bay that affect biota, the chemical makeup of the water, and drainage outlets. To keep the local bay tributaries and communities clean and beautiful—and to help protect the 43 fish species and 200 bird species that live in the Anacostia River watershed—the Prince George’s County Department of the Environment (DoE) launched a mobile app to track litter. 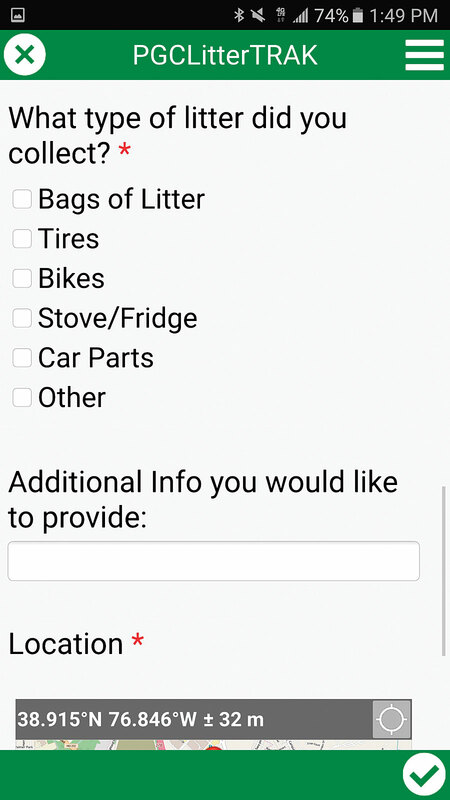 Built with Survey123 for ArcGIS, the app, called PGCLitterTRAK, allows county residents, community organizations, and businesses participating in cleanup activities to use their smartphones to quickly record information about the trash and debris they collect. “Using Survey123, we developed a simple tool that empowers people doing cleanup work to report back to us on the quantity and location of litter,” said Rutherford. In 2010, several state and federal environmental agencies, as well as local and county government departments, drafted an interjurisdictional trash cleanup blueprint for the Anacostia River. To satisfy federal water quality standards, it mandated that Prince George’s County reduce the amount of garbage in the watershed by 170,628 pounds per year. 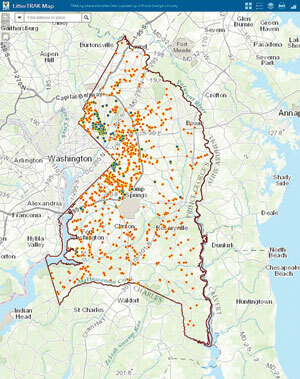 Prince George’s County was already using ArcGIS to show how it was meeting its trash reduction targets. But data collection and documentation were off. Only certain types of refuse picked up in specific watersheds receive trash removal credits from the Environmental Protection Agency. Yet the county could not validate the litter picked up by local organizations and the public, nor could it categorize the array of trash collected by its own garbage trucks. To more effectively demonstrate how hard the county was working to reduce the amount of litter going into the river, Catherine R. Escarpeta, a senior GIS analyst with DoE, decided to use a resource the county already had: an ArcGIS Online subscription. Employing Survey123, Escarpeta built PGCLitterTRAK, which lets trash collectors record the number of bags of litter gathered, the types of items picked up, and the locations of the garbage—all on-site. At no extra cost, Survey123 was ideal for this project. Its formcentric design, ability to collect location information in the background, and capacity to upload photos made it easy to use. In addition, Survey123 allowed the county to publish its litter tracking app to Android, iOS, and Windows devices seamlessly, so large numbers of volunteers and employees could use it. PGCLitterTRAK only asks users about what they are doing at a specific location to ensure that the county receives the correct data. Above all, Escarpeta wanted to make the app easy to use. She included setup hints—snippets of text, like a sample email address or phone number—that help users answer questions correctly. She also ensured that the county could validate the data by requiring some questions—such as What is your organization?—and giving others drop-down menus so users only have certain, uniform answers to choose from. Additionally, Escarpeta customized the survey so that some fields, especially those required to accurately report litter cleanup to the county, get completed automatically upon submission. Escarpeta also wanted to ensure that Prince George’s County received the correct data. She focused the app’s questions on the quantity and location of litter collected. For example, when filling in the type of garbage being picked up, if a user selects Bags of Litter, the next question will be, How many bags? If the user selects Tires instead, the app will ask, How many tires? Users can upload photographs to further document their cleanup efforts. And hidden fields within the app—such as fiscal year, council and maintenance districts, and watershed data—ensure that the information can be automatically exported to the proper departments within Prince George’s County without bogging down users with extraneous details. “PGCLitterTRAK and Survey123 enhance the user’s experience by only asking about what that person is doing at that specific location,” said Escarpeta. The app also functions offline, which is crucial to tracking and reporting litter, since parts of the county have limited wireless connectivity. Additionally, various functions built into users’ devices, such as the voice-to-text capability, work within the app. With PGCLitterTRAK, county workers can track everything they pick up and even upload photos—right from where the refuse is located. Once users collect data out in the field, PGCLitterTRAK connects directly to LitterTRAK Map, an internal web-based map that Escarpeta built using Web AppBuilder for ArcGIS. With LitterTRAK Map, county employees, such as program managers and crew supervisors, can review and analyze the litter data coming in from throughout Prince George’s County. Escarpeta can add layers to the map as well—such as hot spot analyses, council and maintenance districts, and other background information—to enable county employees to better visualize the data. 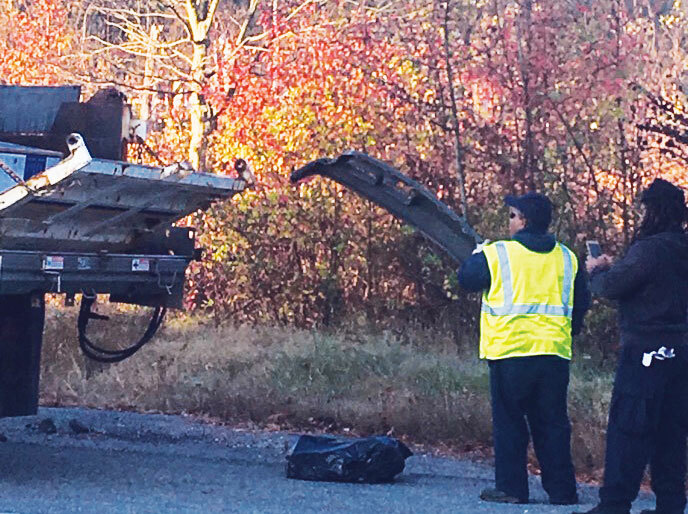 With all this, agencies such as the Department of Public Works and Transportation and the Department of Permitting, Inspections and Enforcement can run reports on the types of cleanup activities they conduct, like roadside litter removal and the disposal of illegally dumped items. These departments can then figure out how to guide legislation and better allocate their resources, determining where to focus outreach efforts to reduce litter, where to place more trash receptacles, and where to position cameras to impede illegal dumping. Although Prince George’s County developed PGCLitterTRAK to target the Anacostia watershed, the app is helping to reduce litter countywide. Additionally, program managers throughout the county are examining how to employ Survey123 for tracking other assets and issues, like storm drains in need of “no dumping” imprints, street signs in need of replacing, and residents in need of little nudges to pick up their pet waste. PGCLitterTRAK is now an indispensable tool for keeping Prince George’s County clean, green, and beautiful, according to Ortiz. “Whether you are cleaning roads, streams, parks, or your neighborhood, PGCLitterTRAK tracks litter reduction achievements and encourages citizens to support the county by volunteering and being good stewards of the environment,” he said. To find out more about Prince George’s County’s litter reduction program, email Rutherford. For more information about PGCLitterTRAK, email Escarpeta (soon to be Catherine Adams).